Hewlett-Packard has just announced a new printer in its LaserJet family. The HP LaserJet IID is a double-paper capacity, duplex printing printer designed for desktop office use. The IID produces quality images with a resolution of 300 × 300 dots per inch at eight pages per minute and includes the ability to print on both sides of a sheet. 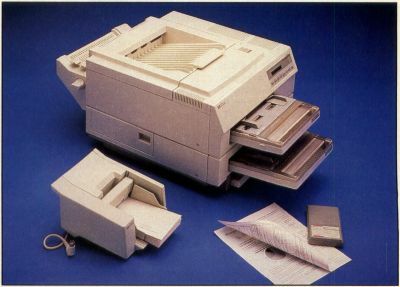 The printer comes with 24 fonts (14 internal and ten on disk), two paper-input trays and can be expanded to higher memory configurations and more fonts. An envelope feeder is also available as an option (for an additional $350). The HP LaserJet IID is available now at a retail price of $4,295. The HP LaserJet IID is available now at a retail price at $4,295.